Government of Grenada and the Grenada Football Association has signed a lease agreement that will result in the upgrading and refurbishing of the Fond Playing field in St. Patrick. 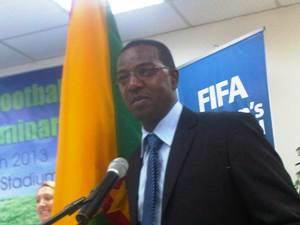 Sports Minister Emmalin Pierre and President of the GFA Cheney Joseph in the presents of FIFA officials who were in Grenada to conduct a three day seminar on Women’s football signed the agreement on Friday 18 October at the end of the FIFA Women’s Com-unity Seminar. The lease agreement according to Minister Pierre provides for GFA to pay the Government EC$1 per year for a period of 30 years in the first instance. “We will now upgrade the playing field with night lights and other refurbishing to the tune of EC$1.3 million,” said President Joseph. The upgrade will also see increase sitting capacity to approximately 1,000 new seats.